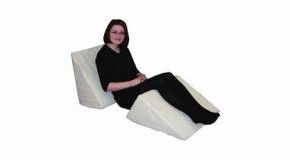 Backrest Prop-up Bed Wedge Comfortable Support. I LOVE these - have had a few courtesy of my district nursing team/OTs over the years, and have found them just great. I like the option of being able to have it in two different positions, plus it's soft and smooth (unlike some other variants with metal/webbing). The only problems I've ever had are in getting a cover for them as they're an awkward size, and also that the foam on the ones I've had has, over time, deteriorated if it is left uncovered for a long time. But other than that, there's really no problem at all and I can happily recommend it to anyone looking for a soft easy manoeuvrable backrest. The wedge is excellent, with a firm weight of foam and a substantial cover. It arrived swiftly and was very well packaged. I am very pleased with it and would not hesitate to recommend both it and the company. Item took 11 days to arrive presumably because the order was placed between Christmas and New Year, otherwise completely satisfied with the item. Bought this because I had,had rotator cuff surgery. This gave me good support and allowed me to get some sleep. I found when I came out of hospital I could not sleep flat with the pain, this helped to reduce the pain. Great product, can be used at two angles. Would recommend. I bought this for my mother who was bed bound and suffering from lung cancer. It was absolutely the best thing I could have got her to relieve the pain and make her as comfortable as she could have been... The quality of the product is excellent and was delivered within 24 hours. Very impressed with the fast service. Product as described and no synthetic smell. Unfortunately it had to go back as it was too upright for sleeping. No returns label but only abou £7 to return. Now waiting for refund. I would definitely use this company again. I bought a backrest and took it away with me. It proved to be exactly what I needed and in fact have had delivery today of a second one for a leg support. Now I look forward to perfect sleeping despite a compression fracture of the spine.